When Morale Dips, Some Cops Walk The Beat — But Do The Minimum Arrests and ticketing are way down in New York City. Many believe it's a way for officers to show frustration with the mayor. If so, it wouldn't be the first time cops have protested by slowing down. 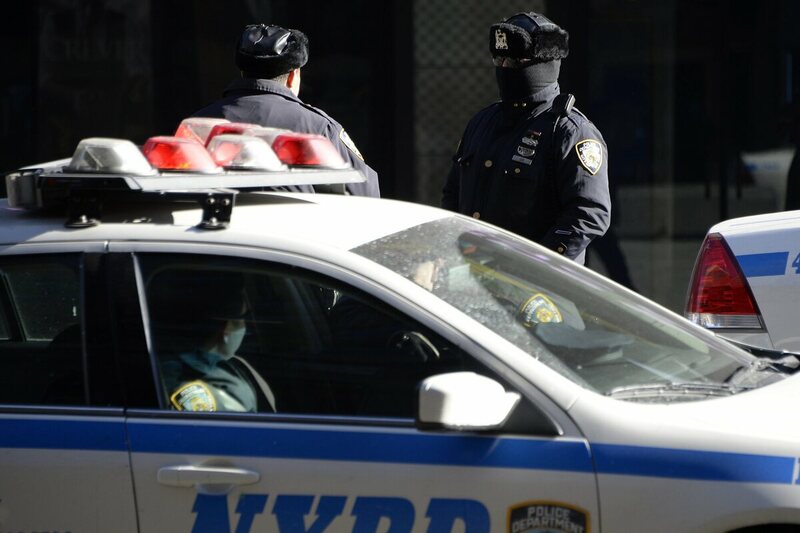 There's been a sharp decline in the number of arrests and tickets and summonses issued in New York City. Police sometimes use work slowdowns to show dissatisfaction with policies, workloads or contract disputes. "If they observe an armed robbery in progress, an officer's going to do what needs to be done. But you're not going out looking for the bad guys." New York isn't the first city to see this kind of protest, in which officers do the minimum required. There are several names for it, too, such as "depolicing" and "rule-book protest." Kristen Ziman, a police commander in Aurora, Ill., uses another term: "Blue Flu." Her department suffered a bad case of it in 2011 after it laid off eight officers. She says the remaining officers became less effective; traffic stops dropped by double digits. "I think that low morale and that anger then really manifested into officers getting in their squad car and feeling that sense of apathy," Ziman says. "And so, for that reason, production went down." These police slowdowns are sometimes caused by contract disputes. Last summer, police in Memphis, Tenn., called in sick in droves when the city reduced their health benefits. That may also be a factor in New York, where officers are in contract negotiations with the city. But when people use the term depolicing, it usually refers to inaction on the job. "In the simplest terms," explains retired Seattle officer Mike Severance, "officers aren't doing proactive police work. They'll respond to their calls, you know, if something heinous happens ... if they observe an armed robbery in progress, an officer's going to do what needs to be done. But you're not going out looking for the bad guys." Severance says depolicing happens when officers feel stretched too thin or overburdened by bureaucracy. It also happens when police feel whiplashed by what seem to be contradictory demands. Take the death of Eric Garner in New York last summer. Police say they were told to arrest people for the minor crime of selling loose cigarettes. "We went there because of those complaints, and police headquarters sent us there!" Patrick Lynch, the head of New York's biggest police union, told NPR this week. "And then what we had, we had someone that's resisted arrest and said, 'I'm not going.' So a lot of folks are telling us what we shouldn't do and what we can't do. But no one is telling us what we should do when a police officer is faced with a resisting arrest situation," Lynch said. Merrick Bobb has heard this kind of thing before. He's been advising cities on police reform since the 1990s, and remembers seeing slowdowns during the reform process in Los Angeles. There was a drop-off of activity, he says, during a period of time while officers were getting used to new rules. But the situation in New York, he says, seems different. "What I think you see in New York is an angry, sullen, in-your-face kind of rejection of the mayor and anybody else who sees fit to criticize the police." Bobb says the NYPD may be due for a fundamental reform program, such as those imposed on other cities by the Justice Department. That approach would not go over well with unions. Aurora's Ziman prescribes a less confrontational approach. She says commanders should recognize that the events of the last six months have undermined the morale of police around the country. "The thing they're struggling [internally] with is ... 'I want to go out there and I want to do my job, but No. 1, is it safe right now? And the second is, what if I mess up? What if I do something wrong, and [am] basically living into the template that everything thinks I am?' "
Ziman says you rebuild morale by appealing to officers' sense of professionalism. For instance, she ended her department's "Blue Flu" partly by giving officers more choice in their assignments. But it's not clear that kind of conciliatory move is possible in New York right now, where the weekly arrest stats are being read as an ominous barometer of patrol officers' mood.